VRBO "Exceptional" Rating -- Fantastic Views! A unique experience on 950 private acres. This 5400 sq ft. 3 story custom lodge will sleep up to 20 guests. We offer 2 great rooms, with 2 kitchens - One for the adults and one for the kids downstairs. There are 5 Bedrooms with a loft, bunkroom, and 4.5 bathrooms. 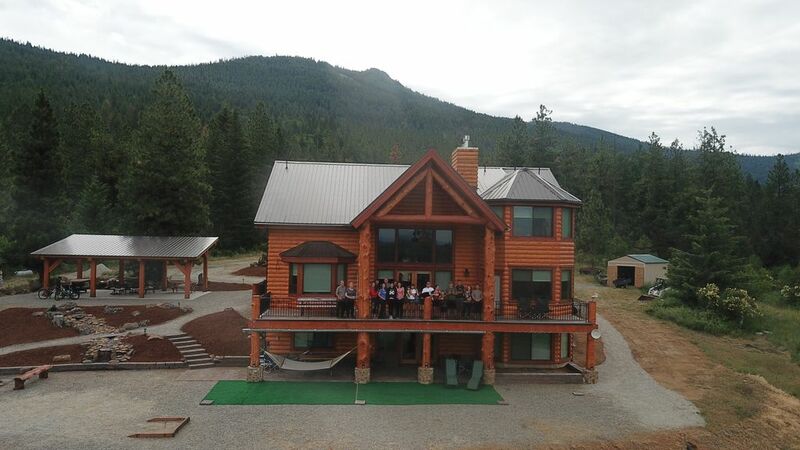 This new custom log home sits on a majestic 950 acres of private property to hike, explore, and view wildlife. Hike to Redemption Rock and enjoy the incredible views and sunsets at an altitude of 4900ft. Google Shasta Butte on Google Earth for more pictures. The property is very private yet easy to get to and is just 12 minutes off I-90 (State Line Exit) where Cabellas and Walmart are located. We are not permitted by Kootenai County to host Wedding Ceremonies. In the Spring of 2019, Redemption Rock Tower will be available to rent and will sleep 4. The tower is a 90 minute hiking destination on the property. It will be a dry cabin, with heat, power and internet. Steve Sr. and Jeanette Wynecoop, currently own a Bed and Breakfast in Redmond Washington and now Redemption Rock Lodge vacation rental in Post Falls Idaho. This is a truly unique property and experience, there is not another lodge or cabin rental that is completely private and conveniently located that sleeps up to 20. The lodge was built in 2015 and everything is new and clean. Did we mention private? 950 acres of play land. Hike for days and never leave the private property. See wildlife from the deck. Beautiful sunset view visible from the deck, great rooms and all guest bedrooms. Picture above taken from top of property at 4800ft. That is Liberty Lake in the background. You can see 5 lakes and the Spokane river from this spot. If renters have full insurance, Horse trails and ATV trails are available. We stayed for three nights in February. This house was perfect for our group. Plenty of sleeping area and room for privacy. It was cold and snowy for the weekend we were in the area so we just stayed inside and enjoyed our time in this amazing house. Would definitely stay again and recommend to others. Beautiful property, perfect for families or anyone looking to enjoy time together in nature. We were visiting the area for a wedding and it was the perfect fit for everyone, from grandparents down to the grandkids. Located almost equidistant from Spokane and Coeur d'Alene, it was great being "not too far" from the places we wanted to go. Sitting high up the mountain, the view out the back of the lodge is incredible. We enjoyed having meals outside in the covered dining area, as well as making s'mores in the fire pit - great times and memories for all involved. We had multiple wildlife sightings during our stay too (deer,elk,fox) which was a big hit with the little ones. The lodge is very well kept and provided more than enough beds for our party. The great room on the main floor allowed the adults to socialize in the evening, while the kids were tucked safely in their beds nearby - impossible in a hotel setting. Plenty of separate bedrooms and bathrooms throughout and two laundry rooms was a nice added bonus. The owners were very friendly and responded in a timely fashion. We had a blast and would come back in a heartbeat. If you're looking for a reasonably priced, great place to stay and spend some time with family and friends, look no further - the Redemption Rock Lodge is your place. All our guest absolutely loved the lodge. Our favorite hangout place was the covered area outside and the beautiful view from the deck. Thank you! This property is absolutely wonderful! We held our family reunion at the Redemption Rock Lodge...it could not have been better! Steve and Jeanette were terrific to work with and the lodge was beautifully cared for, comfortable and spotless! My family wants to come back again! I highly recommend this property for a large or small group....beautiful setting! At Stop sign turn South (Right if coming from Spokane - Left if coming from Post Falls). Take LEFT on W. Holland Rd. ( Cellular signals will be lost from Holland to end of Stateline Rd). Drive East (.02 Miles) - Take RIGHT on S. Stateline Rd.